Most of the bloggers and webmasters already know about Adsense by Google but here I am sharing this information for new bloggers who want to create a new Adsense account. 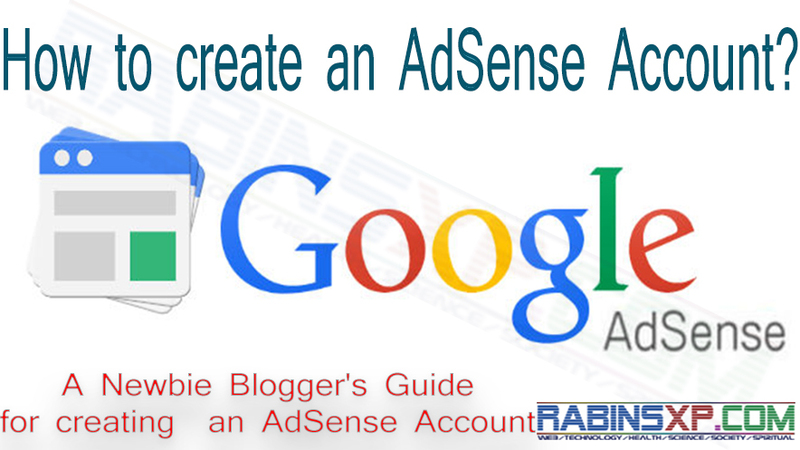 Here you can learn how to create an Adsense Account (especially for newbie bloggers). Well, Adsense is a contextual advertisement program by Google which has been one of the best of its kind. Now let’s learn how to create a new AdSense account for your blog or website. But before you start creating the account you need to know there are some requirements you should meet. You must be 18 years of old by the time you are applying for the program and you should have at least one blog or website which I assume everybody knows now. What are the steps for creating an Adsense Account? The answer to this question is simple just as the process is. You need to signup for AdSense by going to Google Adsense Site, add your website or blog address (domain) and wait for few days before you receive approval or rejection email. Now if you can’t understand what has been said before then here is the detail steps by steps guide for you to create a new AdSense account. As in the title, you need to go to the Adsense Signup page from where everything starts. I have found that there are more chances of Adsense approval when you use your custom domain email address instead of other email address. If you don’t have any then Gmail is fine too. As they say tell us about your content, just enter your domain name in the “I will show ads on” box and do not use HTTPS or HTTP but can use with or without www. Select your language. Usually, there prefer English language but it’s not mandatory. You just put in what language your primary contents are. Well if you can read, read the Terms and conditions but clicking on continue button you agree that you will follow all the TOC’s. And you must follow too. Read the AdSense policies too. In this part, you should not make any mistake. Your payee or payment name should not be mistaken. It should be your legal full name. For example in Nepal, usually the legal name from your citizenship card, passport, driving license or government documents. If you are from Nepal, check this: Earn Money Online Using Google Adsense in Nepal. Now your work is to wait for approval. It will usually take 10-13 days because nowadays the approval process is manual and the Google’s staff may hold on for further verification. Make sure your blog or website has quality contents, sufficient traffic (minimum 30 hits per day is sufficient for a new blog). Remember, a good website or blog design can impress the Google’s staff and your submission might be accepted sooner. After your submission gets approved. Non-Us for people outside the USA. Usually, choose NO in every three options or choose what applies to you. Now you can create a new AdSense ad unit or associate to your blogger dashboard. Just copy the created AdSense’s ad code and paste on your blog or website where you want your ads to be displayed. After you make $10, you will receive a verification PIN number sent to your postal address. Open the letter, and use that PIN number/code to verify your AdSense account. Well, now it’s up to you to make $100 – $1000 or more. You will get payments for making minimum $100 each month. After the threshold reaches to $100, you will get cheques or Western Union money (MTN) code or direct bank deposit depending on what you have chosen in Payment option. I will you a good luck with your Adsense account creation and hope you will start earning soon. If you still have anything you ask, feel free comment below. I will be happy solving your queries. How To Verify Google Adsense Account Without PIN (With Documents)?